I loved your course and found it enlightening all around. I was surprised to find how many well known people in history and present were humanists. Jennifer Hancock's Living Made Simpler Course is a "must" for every humanist and for anyone who wishes to learn more about the Humanist worldview and life stance. I hope she will develop more of these courses in the future. Your class on The Humanist Approach to Happiness illuminated my own shadowy spiritual path, helped me to define who I am, what I want, and ways to attain my own spiritual salvation. Thank you, Jen. Your class was very important. I really enjoyed the readings and videos ... They clarified many issues for me. Thank you. You have helped me sort out so many issues in my Life. Living Simpler was definitely an interesting review of fundamental aspects of life that can benefit much from the humanist worldview, such as ethics, critical thinking and personal responsibility. Weekly themes of the course were well selected and clearly presented. I really enjoyed going through the course. Please note: this course is for your personal use only. If you are interested in presenting this class to a group, please contact Jennifer to make arrangements. With this download you will be given download codes for 6 different zip files. Each zip includes a 1 hour video of the lecture in wmv format along with 2 pdf files. Each zip is about 200MBs in size and take about 20 minutes to download on a high speed connection. Your free gift offer is on the syllabus included with the first file. Warning: If you don't have a high speed connection, don't purchase this option. 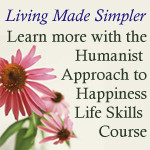 This is the audio of the Humanist Life Skills Course, Living Made Simpler - The Humanist Approach to Happiness. This program was designed as a video program. These audios are simply the audio from the video lectures. It is being provided for those who prefer to listen to books on tape. Most of the discussion will be easy to follow. There are a couple of instances where an image is referenced, but that is rare. This program contains 6 - one hour long audio in mp3. This version of the program includes the lecture notes and handouts as well as a discount on Jen's other books as well as a free copy of Jen Hancock's Handy Humanism Handbook. The audio on the first two lessons is rather noise and at the start of some of the files there is a spike that is annoying, but it doesn't recur, so please be patient with it. Note: This zip file is 288 Mbs. On a high speed modem it will take approximately 1/2 hour to download. If you are on a slower dial up connection, please don't purchase this product. Taught at Humanist Learning Systems - this 6 hour program is online. You must have internet access and ability to view youtube style videos. The benefit of the online program is that you have access to Jennifer to ask questions in the discussion forums. This program is being sold for personal use only. If you want to show it to the public or use it in a group setting, please contact Jennifer to make separate arrangements. Payment is done through PaylPal or through Wufoo/Stripe. Check out is handled through a secure website to complete your transaction.